Seleta Reynolds worked on cycling and pedestrian issues in San Francisco and will take over LADOT if Mayor Eric Garcetti’s pick is confirmed by the City Council. LADOT runs the DASH bus system and controls traffic signals in L.A. — yep, the traffic signals that Metro buses and trains must abide by. In L.A., Reynolds will be paying particular attention to the city’s expanding bike lane network and initiatives to put selected portion of some streets on a road diet. The City Council tends to micro-manage these things, making LADOT chief one of the tougher jobs in L.A. Speaking of San Francisco, a humorous post at Streetsblog on what happened when the city closed the curly part of Lombard Street to car traffic on a trial basis to reduce tourist-driven traffic jams. “Chaos” in the words of one television reporter. The article is mostly about FasTraks, the sales tax increase approved by Denver-area voters in 2004 and that would help fund 10 transit projects. The price-tag has risen from an original $4.7 billion to $7.8 billion and not everything is built. 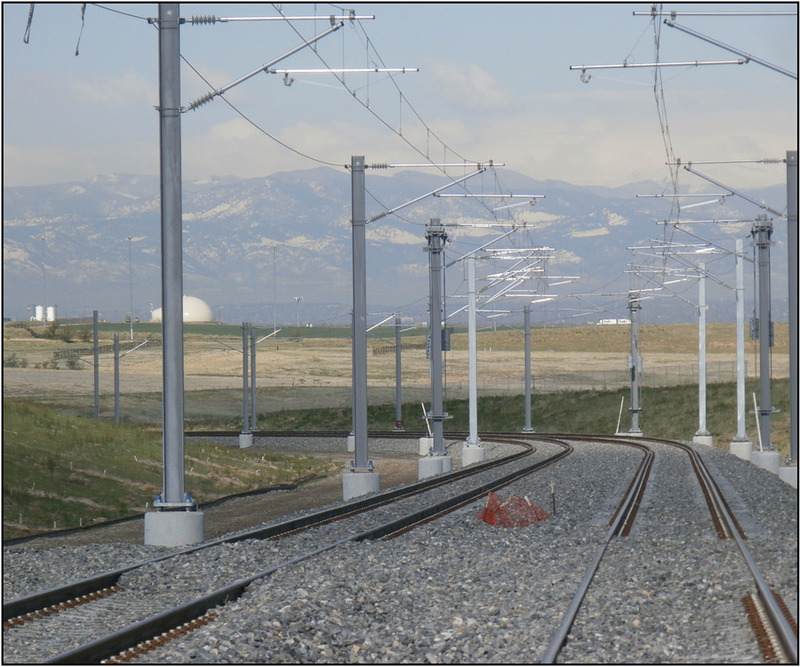 But progress has been made and there will soon be bus rapid transit to Boulder, more light rail and a new commuter train to Denver International Airport, which sits far east of the city. But….many people say that Denver remains a car town with about six percent of commuters using transit to work — less than in places such as Los Angeles, Calgary and Atlanta. The challenge is classic and familiar: the Denver metro area is big and sprawling and getting people to and from transit stations isn’t always easy, especially when those people already have cars. Nonetheless, I suspect the region will be well served by its transit expansion in the coming decades as more development eventually finds its way near stations, the downtown resurgence continues (and it’s been going on for quite some time) and there is a realistic transit option that previously didn’t exist. Tracks on the rail project linking downtown Denver to DIA, which sits on the prairie far east of town. Photo via RTD’s Flickr page. A reporter goes on an “exhaustive” and long walk with DTLA real estate agent and blogger Brigham Yen, who writes the great DTLA Rising blog. The Register article is, however, short and doesn’t really get into any significant issues involving downtown. The Register is being touted as a new daily newspaper covering L.A. but most of the articles I’ve seen are of the very short featurette variety. There’s a lot more down there than just The Underground — Roman ruins, offices, bunkers, tombs, trains and forgotten rivers. Watch the episode to see more. The program will supply about 40,000 free rides to students under 18; schools must apply for passes. Metro has a similar program! If you are an educator, please click here for more info on applying to get passes. I can attest to Denver’s transit system being…rather lackluster right now. The bus routes are nonsensical and rather annoying (instead of going, say, straight down a street east-to-west, it has to loop north and south to hit the light rail stations and downtown and what should take 20 minutes (I took a similar route heading east on one bus, and it literally took me only 20 minutes) took me over an HOUR on the way back – at noon, so it’s not like it was rush hour. In fact, most of the buses I’m on always either go out of their way to hit the light rail stops, and/or then WAIT there for 5 minutes or so for the next train to come. It’s completely aggravating when I’m trying to get to work or school on time. And while I have a student card (that’s probably factored into my tuition), the prices are still much higher than Metro’s. It’ll probably be nicer in a few years when the trains actually go somewhere, but as it is now, Denver’s RTD is a bit of a joke – which is unfortunate, because it could be so much better. As someone who occasionally visits the Washington, DC area, I’m so looking forward to the Silver Line opening next month. 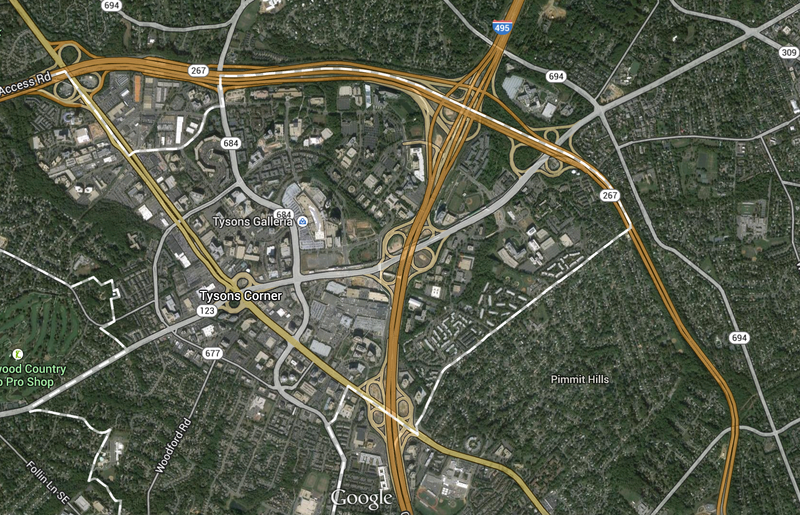 Tysons (Corner) has become one of the nation’s largest job centers but always lacked mass lacked to serve that part of Northern Virginia. Assuming the extensive delays in getting the rail/subway line ready are finally over, the Silver Line will change Tysons for the better.